Reach more people by getting your supporters online with a Fundraising Page. Raising money for charity shows someone cares deeply about your cause. Doing it online with a Fundraising Page makes it easy for them to share their story on Facebook, Twitter and on email, so they can inspire more people to give to your charity. From adding photos, to posting updates, people can tailor their Fundraising Page to suit them. Pages with targets raise 46% more. Encourage your supporters to be brave and tell the world what they’re aiming for. We’ve got Like and Tweet buttons in all the right places, so it’s easy for people to share their Fundraising Page. Do we get the fundraiser’s data? Yes. You can use their email to contact them about their Fundraising Page and if they opt-in to communications from your charity, you can also send them marketing newsletters. Is it easy to donate on a mobile? It sure is. Our mobile-optimised donation flow makes it easy for people to give on any device. Can people fundraise as a team? Yes. 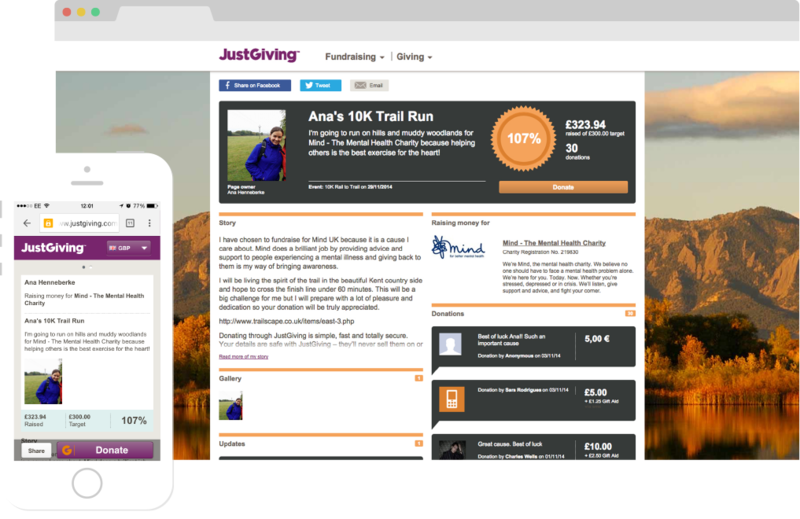 With our team pages, people can join together their Fundraising Pages and work together to reach a fundraising target. Learn the secrets of the perfect Fundraising Page. Discover how we can help you raise more online.